You get your shot and then it’s done. This is a cornerstone tenet of baseball’s unwritten rules. If an opponent upends you—hits your batter, takes out your infielder—you have an opportunity to make things right. Singular. After that shot, hit or miss, you move on. That’s what makes baseball’s code functional, and its functionality is what has allowed it to persevere. On Friday, Oakland’s Brett Lawrie took out Royals shortstop Alcides Escobar with a late, awkward—and, say some, dirty—slide. On Saturday, Yordano Ventura planted a 99 mph fastball into his ribs. Ventura had his shot, and it should have settled the score. An aggrieved and injured player is enough to motivate disquiet in a clubhouse. The fact that to that point in the season the Royals had been hit by 13 pitches but had only hit three themselves could also have played a part. There is no need for those numbers—hit batters on your side vs. how many your own team has hit— to be equitable, but a wild imbalance in that ratio can serve as an indicator for position players about whether their pitching staff is appropriately guarding their best interests. Were there ill will on the Royals in that regard, Ventura at least partially righted the ship with one blow. Baseball’s code indicates that at this point the score was even, both teams debt-free. That’s not what happened. 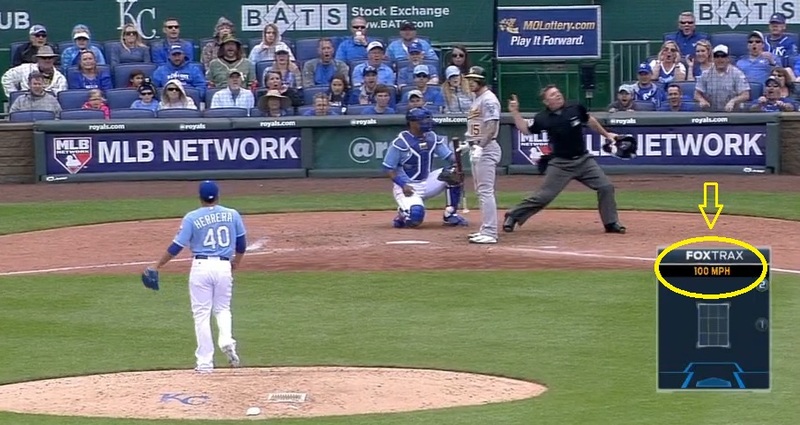 In the first inning on Sunday, Scott Kazmir hit Lorenzo Cain in the foot. Both benches were warned, and Ned Yost and pitching coach Dave Eiland were ejected for arguing the issue. (Watch it here.) Were the pitch intentional it would have been entirely out of line, and the fact that Kazmir’s control for the rest of the game was spot-on does not reflect well on him in this regard. Still, a foot is hardly the target of choice for a pitcher with retaliation on his mind, not to mention that there was little reason for Kazmir to extend hostilities. It still wasn’t enough. On his way off the field, Herrera looked toward the A’s dugout and pointed at his head. He later said that he was trying to say Think about what happened, but many in the A’s clubhouse took it as a threat to come closer next time. There is no more clear-cut violation of the unwritten rules than to threaten to throw at a player’s head, and if there was anybody in green and gold willing to give the Royals the benefit of the doubt, Herrera’s pantomime effectively cemented their opinions in the opposite direction. Things could have ended after Lawrie was drilled on Saturday. They could have ended early Sunday, had the Royals ignored Kazmir’s fastball of debatable intentions. Now, though, the bad blood between these teams will be front and center when they meet again in June. It’ll be interesting to note whether the Royals’ HBP ratio will have changed by that point, but it probably won’t matter; the A’s are an outlier to them, and vice versa, and no amount of Royals whispering by Billy Butler is going to change things. This one will play out on the field. Update (4-21-15): And repercussions have been repercussed. Herrera gets five games, Ventura a fine.